Hello Everyone. 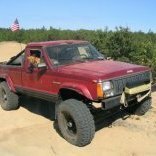 I'm fairly new here and I have been lurking about for a couple of years since owning my Comanche and did not sign up until recently. most of every part replaced is junkyard OEM or NOS from the dealership I work at. At last here is Little Red. 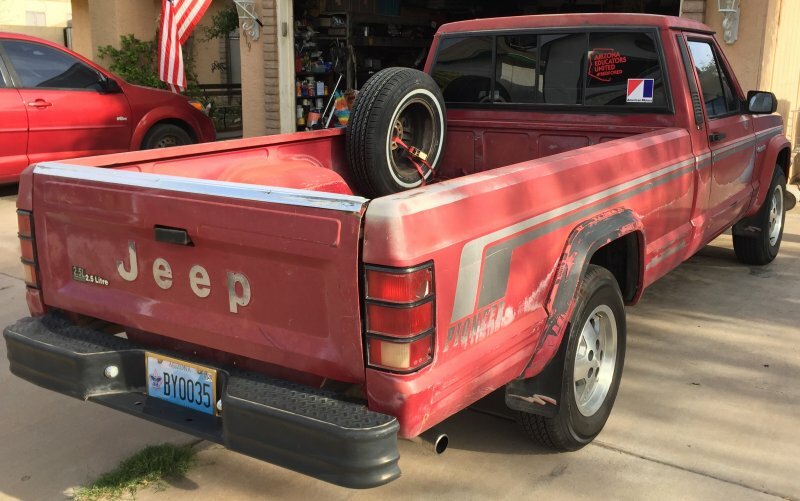 She is a 1988 2.5L 5-speed Pioneer Comanche. Built 11/15/1987 and she left the factory bare minimum as a Pioneer trim. She started with an idiot light cluster and white trailer like rims but came with floor mats with matching dash mat, mud flaps and a tailgate liner. 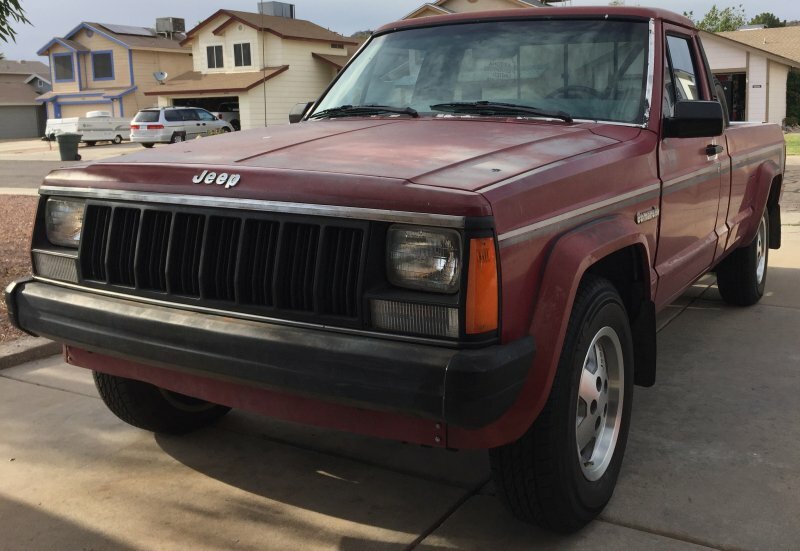 Since owning her I have done some upgrades such as a 5/6th gauge cluster, various factory lights add-ons, clock, headlight warning buzzer, sentinel headlamp module, hood insulation, AMC jeep nameplates, 2.5Litre nameplate, and a NOS hard plastic valve cover. I changed the rims to the star "Jeep" engraved rims from the trailer looking rims. The only non factory thing added is an LED under hood light strip. Year 1: Upon acquiring her I did basic repairs and fluid changes to bring her back to life. Fuel pump was dead and had to replace that and various other tune up pieces to get her going again. My father redid the door panels and headliner. after running brown coolant started showing up and could not figure out why. before the jeep rims I repainted the white rims to a black color so they didn't look awful. took me a couple of years to hunt down a set of 5. Year 2: Figured out the cause of the brown coolant being a blown head gasket and changed that in the summer. Surprisingly the head gasket was 30 years old and I'm surprised is lasted as long as it did before it gave out. Sadly due to pressed time I did not have the head rebuilt until this year. A few months after changing the head gasket I changed the motor mounts and due to a bad drive shaft causing awful vibrations I destroyed the AX-5 transmission. Had to replace everything from the bellhousing to the driveshaft. lesson learned, never underestimate the 2.5L. After that I learned to seat the pilot bushing all the way into the flywheel. Year 3: Early this year I changed the water pump out and the window seals replaced. In march I replaced the oil pan gasket and repainted it as well, cleaned up the engine and engine bay. had the head rebuilt and upgraded to a leather steering wheel recently. Also replaced the 8 slot grille with the 10 slot variant and replaced upper radiator hose. End goal is complete restoration with some other additions. Sorry about that. Just three years of summarizing. I will upload more pictures from early on as I find them. And that engine bay looks clean! Thanks! The 2.5L is a great little engine, been through a lot too. Got a factory spare tire cover today, now the spare won't bake and get destroyed by the Arizona sun. Also got some factory front fender liners to install, hopefully someday. Why is the spare in the bed instead of under the bed? Well its been a bit since I've updated my project. I have not done much up until a couple weekends ago. I replaced the old fender liners with new stock parts, only took about an hour to do. The following weekend I replaced my alternator with a new one with the correct pulley to line up the belt drive, that was a battle and a half with napa. Once installed I went through and wire loomed any wires that were not already protected. Also changed out the clutch and brake pedal pads with new stock pads. Next is to do the headlight harness upgrade this weekend. Some of the new parts used. Craptastic photos of installed liners thanks to the AZ sun. I love that headliner material! nice choice! Have not done much to little red. She's been running great and will be getting an oil change tomorrow. Recently I replaced the front marker lenses with new ones from Chrysler, the old ones weren't reflecting light very well and showed age. Also managed to snag a few other vintage parts as well, mostly steering linkage parts. Also pulled timing cover and replaced the gasket that failed after replacing the gasket the first time. While there I replaced the timing guide and painted the cover. Two weekends ago I had ordered a new leaf spring for the drivers side, one of the leafs on the spring was broke and I was driving her around like that for three years. It was time to replace. I wanted to do the metric ton leafs but that would have cost a fortune, so I just replaced the broken one. got that leaf installed, while I was there I replaced the old poly bushing on the other leaf and boy the rear is smooth to drive with. When I was replacing the leaf, I had learned that the alignment pin for the new leaf was just too big for the hole. So I removed the old leaf pin and replaced it. Course this was discovered after fighting with aligning the axle for thirty minutes. 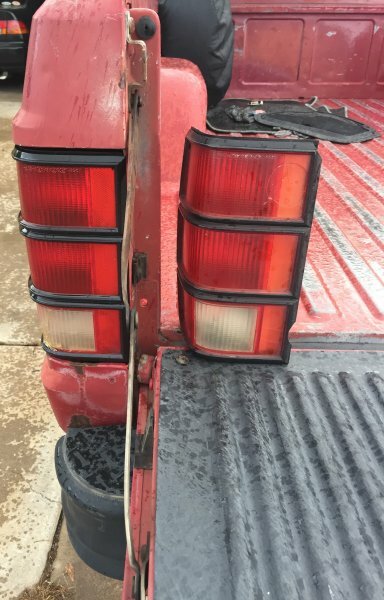 I also managed to snag a drivers side tail light off of ebay and its more complete and in better shape than the original one despite the crack in the reverse lens. Lastly I replaced the last original dome light I had for another euramtec light as the original just finally gave up and broke. I would post a pic but we know what the euramtec light looks like installed. In the mean time, I've got a few goodies coming and an idea. Now that all the goodies have arrived, new passenger side taillight, cargo light, jeep mud flaps, front wiring harness and driving lights. Cleaned up and polished the taillight and replaced it. next is to do the cargo light when I get the chance. The mud flaps will be a later install as well as the driving lights. Now on to what I actually did this weekend. I just replaced the old bumper on Little Red and gave her a new old stock bumper with bumper guards and new end caps. Prior to the install I prepped the bumper with some clear coat just to protect the paint. Now removing the old bumper was not terribly hard, it was mostly pretty straight forward. I learned that I need to replace a mounting bracket as it is somehow warped yet held on to the old bumper just fine. So installing the new bumper was more of a challenge then what it should have been. So now I need to replace the bracket and work on installing the lights. Now my idea was to find some terminals that matched the ones to the headlight harness, my search came up with nothing so far, I was going to buy new terminals and just add the wire to the harness to use the factory switch. I then just gave up and bought a harness and am going to use the terminals from the other harness to install the lights. I ended up welding some weak points on this bracket until I replace it, that was fun to do. But they came out pretty good once they cleaned up. I am really loving what I have done over this weekend. I did forget to mention I found and new old stock vacuum ball and replaced my old one as the mounting screws and holes were gone. Also used new old stock end cap brackets I found on ebay due to only having one end cap having a bracket and the other side not having it. A few weekends ago I installed the driving lights to the factory harness, sure enough they work as intended. 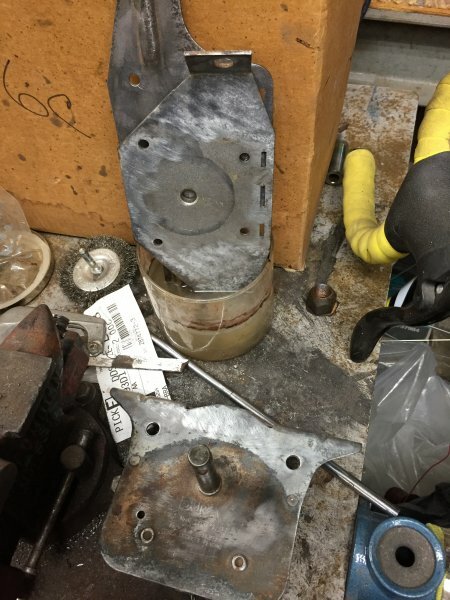 I have been replacing steering components over the course of time since the last post. One more piece to replace and that's it, just had to buy a MoPar steering dampener with hardware to replace the hardware I damaged. I also did a little detailing to the air box and I'm surprised it turned out well. All I did was repaint the silver stripes. As she sits now, I like the look of these lights, but the backs of them sit too close to the grille but that's fine. I also got a new to me tailgate and the color matches but is less aged than my old one. This new one closes all the way as opposed to one side latching and the other bulging outward. Its only been a month and I've done a couple things. First the drum brakes got replaced, learned that it helps to have the right spring for the emergency break. Second I finally found the full gauge cluster that I have always wanted that has been labeled as the "rare one". Yep, that's an 87 full gauge cluster. Not an 86 with the old speedo cable, but an 87+ speedo setup. The tachometer was set up for a six cylinder and since I did not have another tachometer or a scan tool, I just adjusted it to my best interpterion of the RPM's to my four cyl. That's all for now. Hopefully soon my R.E.M. tool will come in by January so I can properly adjust the tachometer. I think it turned out well. Actually works well too. I need to take it out and paint it so it won’t rust but that will happen with a tire rotation. I also replaced the bushings that hold the coil springs in place for a smoother ride and all I can say is wow what a difference those bushing make. Take that thirty year old rubber. Lastly I found a Jeep fuel injection nameplate that I have been looking for for a while now and all I can say is that it’s really cool to have. I’d like to actually remake a lot of these nameplates out of aluminum. Sadly I lack the experience and tools to do such. Next up, factory bed mat on the way and possibly replacing the door checks. Well the bed mat came sooner than expected and all I have to say is I really really love it. It needs a cleaning, maybe a pressure wash but it’s awesome. I can’t decide if I want to put the rubber tailgate cover on or the plastic cover. Any opinions are welcome. 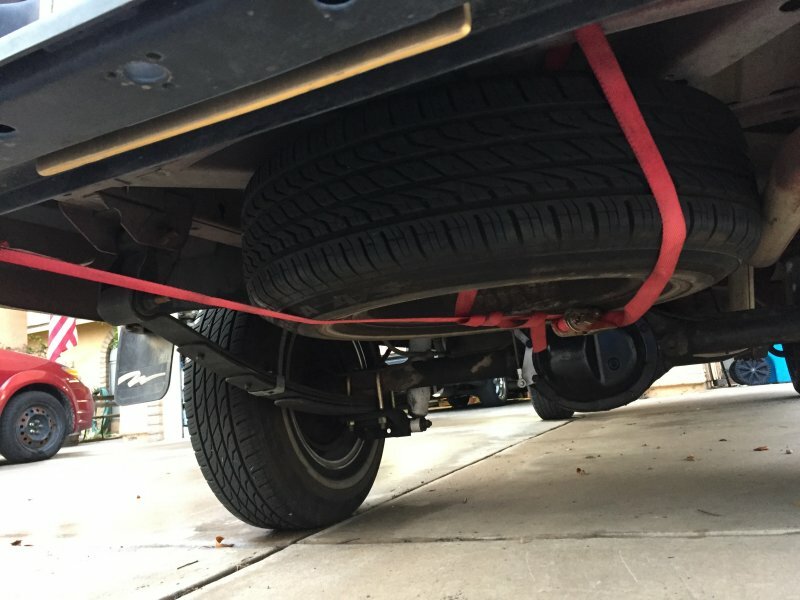 I've never had a rubber tailgate protector, only plastic. neat! does the rubber tailgate protector wrap over the top of the gate? What brand of bed mat did you get? Are you also planning to install a tonneau cover? It’s a factory bed mat I found on eBay. Don’t know who makes it. I wish Chrysler had a complete archive of who they and AMC used for their accessories. I decided to go with the plastic liner.....boy is the new tailgate dented inward. I got the plastic liner to fit but to slide the chrome wrap-around on was a pain. But now it looks nice, with some warping at the bottom but that's expected on a pushed in tailgate. I spray painted the lines sliver then came back and painted the whole thing black, I think it came out pretty good, toughest bit was the AMC emblem. Lastly I finally replaced the manual mirror for a remote one and the door checks. I went with a used factory mirror and not an aftermarket as the aftermarket holes on any mirror are not threaded. At least any I have ordered were not threaded and did not secure tightly to the door. Apparently these were broken and I had no idea till I started removing them. If your door(s) flies(y) open, this is probably why. That is a very nice little red wagon you have there! I really like the silver touches on the air box and valve cover. Keep up the good work! I like it. Course there is only four of them to see but I did paint all six. That looks awesome. Defiantly makes the air cleaner look nice! I will add that to my to do list.